Our feature photo shows some very attractive young ladies on the Supporters’ Stand at the Brighton Ideal Home Exhibition three weeks ago. 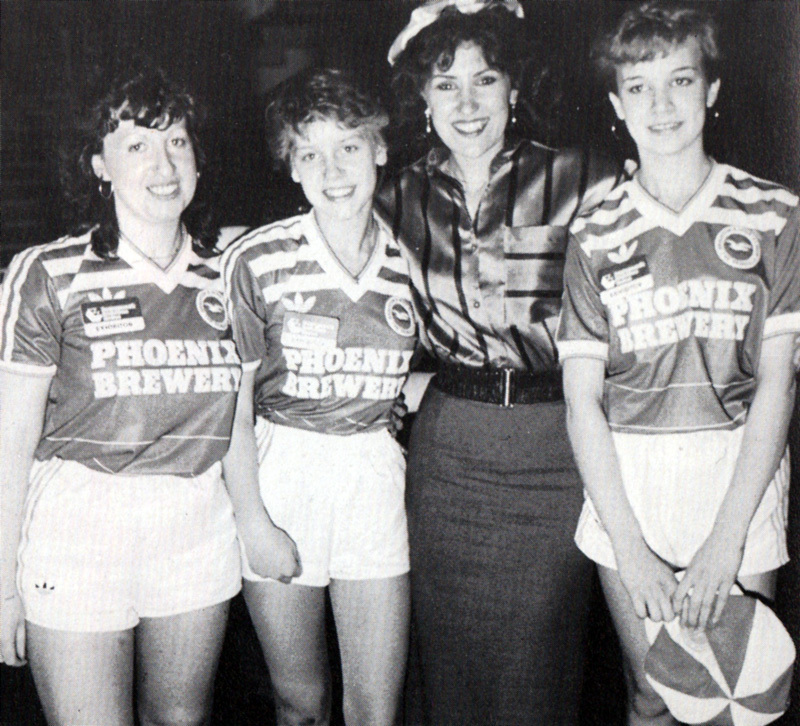 Gill Lacey, Claire Williams and Kieron Dorey are wearing the Albion shirts but the ‘gal with a smile’ in plain clothes is Angie from EastEnders, screen wife of ‘Dirty Den’, otherwise (known as) actress Anita Dobson. Maybe the fans could have interested her in securing a deal for Phoenix Brewery at the Queen Vic! 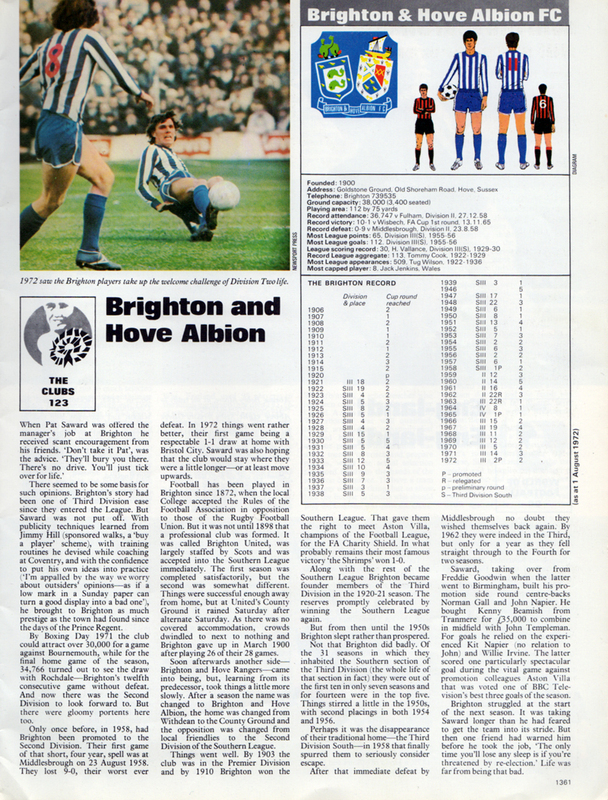 In the 1970s and 1980s, the Evening Argus newspaper was living in the dark ages compared with the lesser known West Sussex Gazette, which sometimes offered glorious technicolor coverage of Brighton & Hove Albion. 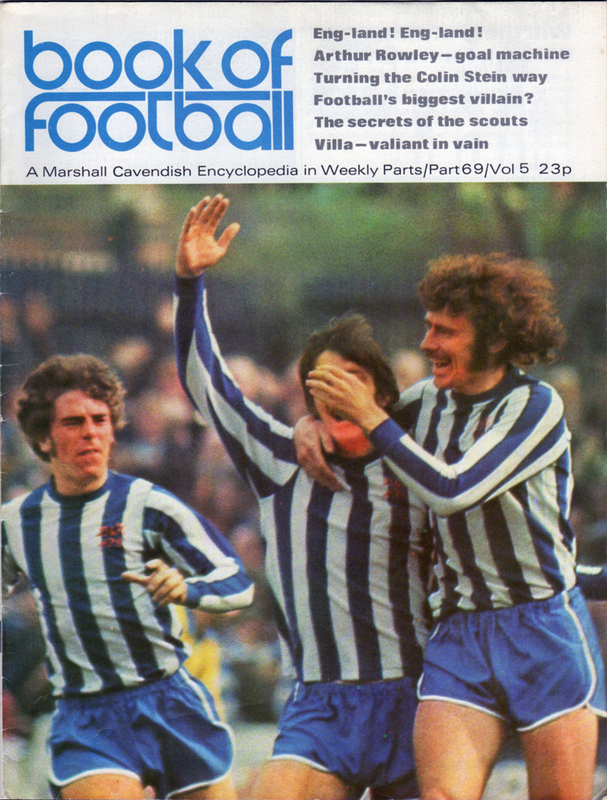 I have a wonderful edition that shows the 1979 promotion parade in colour, but I’ll save that for another time. A dream came true for ten-year-old Jason Byrne on Saturday. 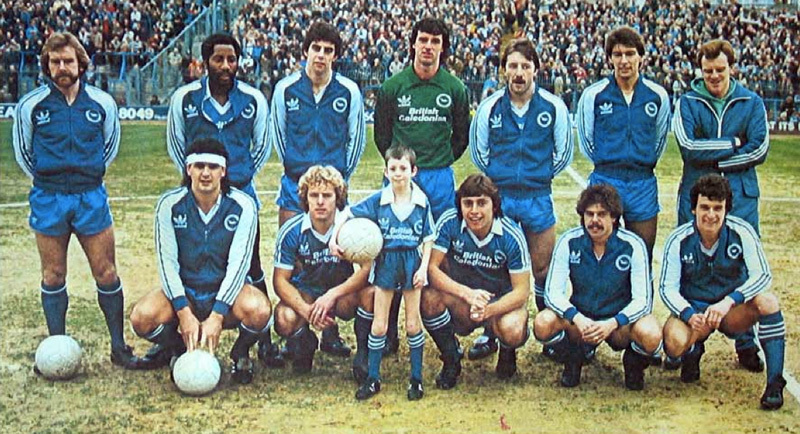 He changed into football kit and led out the Brighton & Hove Albion team before their match against Luton. Jason, who lives in Coombes Road, Steyning, regularly watches all the team’s home matches and has longed to meet his hero, player Peter Ward. His grandfather, Mr Ernest Lidbetter, of Storrington, tried to arrange a meeting with the team by writing to Jimmy Savile. But when that failed he wrote direct to Brighton and Hove Albion themselves. Yes, you read that right. Just as well! So, Jason became mascot for the day to the team he avidly supports – and it was a double celebration for his family. His debut before the crowd was on his mother’s birthday. “It could not have been a better birthday present. When I watched him lead the team out I was overwhelmed and it brought tears to my eyes, says Mrs Sandra Byrne after the match. Jason’s father, Mr Michael Byrne, was also there to watch his son have a kick around with the Brighton team before the match. He had bought tickets for all of Jason’s grandparents so they could watch. Jason is a very keen footballer and players for the under-11 team for Steyning Strikers. He is a pupil at Steyning Junior School. 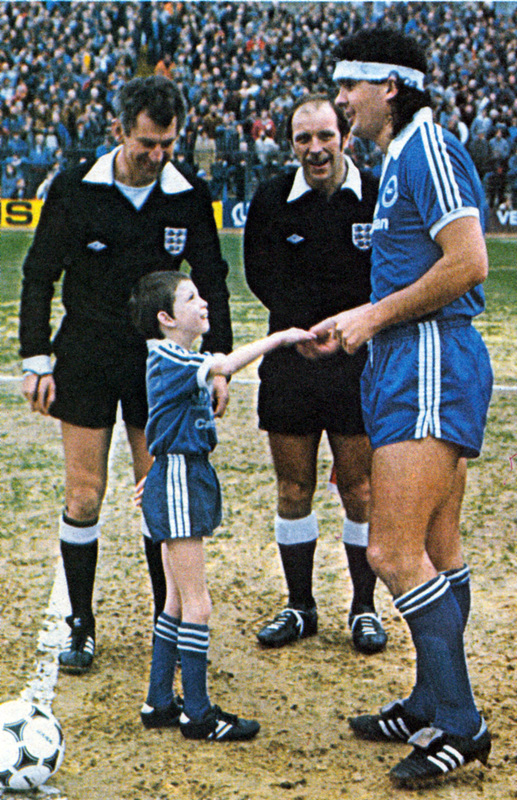 He had his autograph taken with his team, and Peter Ward, and with the referee and now has a referee’s whistle from the match to remind him of his big day. He kissed the coin for good luck before it was spun to start the game – but the two goals it brought Brighton was not enough: they lost 2-4. Life as an apprentice footballer is a hard slog – have no doubt about that. The basic hours are nine to five from Monday to Friday, with a game on Saturday morning. The social life is very limited. You still want to be an apprentice? Well read on, because if you love football, then – at the risk of repeating myself – it’s a wonderful life. Whatever you earn, you are being paid for doing what you enjoy. You have free lodgings and meals. You ‘play games’ for most of the time. And, if you’re with a big club, you mix with, and learn from, the stars. The chores that apprentices do are all connected with the cultivation of pride in the club. They are not provided just for the sake of finding them something to do. All are necessary jobs and someone has to do them. An apprentice is not a groundstaff boy, as youngsters used to be, although there are jobs connected with maintenance that he might occasionally help with. 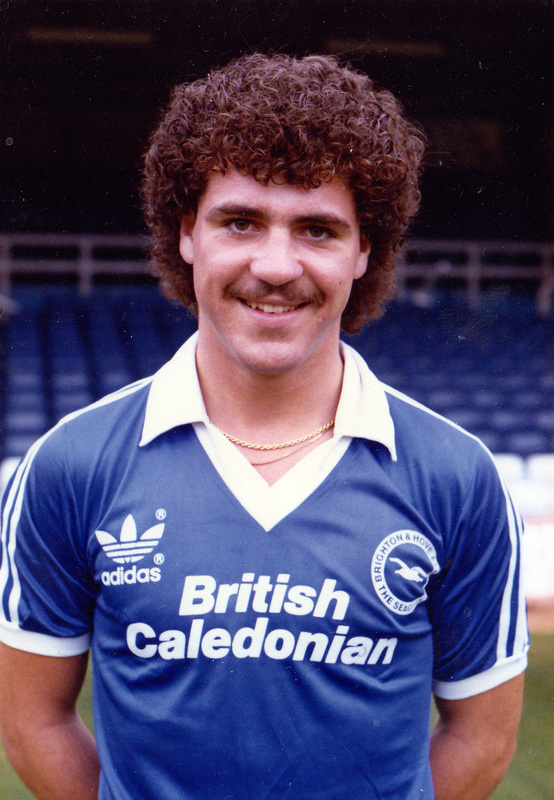 Hailing from Southport, he came to the club as an apprentice in September 1980, featuring regularly for the Albion in the youth side that won both the Hampshire Youth League and Youth Cup in 1980/81, before playing for Albion reserves in the Midweek Football League. A left-back by trade, he had a strong robust physique for one so young. He was picked for the Irish youth trials in Dublin in November 1980. At the age of 16, he eventually became an Eire Youth International when he played in the number 3 shirt in a 2-2 draw against Wales in Swansea in February 1981 as part of the European Youth Championship. Despite international recognition, he suffered with his knees, and it soon blighted his progress. 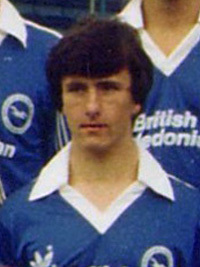 Goalkeeper Simon Steele (below left), who was to play for Brighton against Real Madrid in a pre-season friendly in 1983, joined a little later than Fleet, around 1982 and he and Fleet were originally quite close friends and they both received support with their progress from Jimmy Melia, then working as chief scout and as part of the coaching staff. 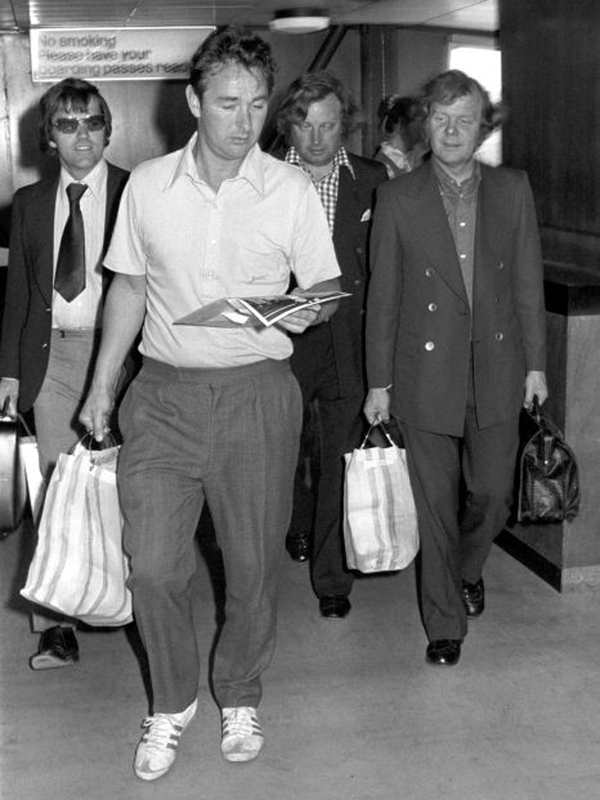 Out of an intake of about nine second-year apprentices in 1982, Mike Bailey signed Fleet and Danny Deans (central photo above) on a year’s professional contract and Matt Wiltshire (right) on a two year pro deal. 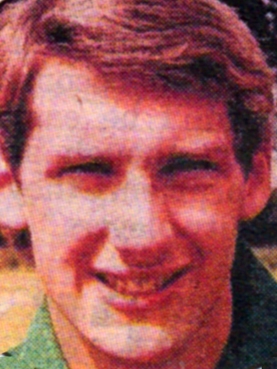 Although a matchday programme from March 1983 mentioned that Fleet had been “improving steadily among the defenders”, he had to have a knee operation that summer and then suffered a recurrence of knee trouble following a very crude tackle on him in a reserve game with Arsenal in the September that followed. It was his last ever game for the club. Fleet and Deans didn’t gain a further contract, and Wiltshire left too after his two year deal expired. During the summer he had another operation, but unfortunately the specialists have decided he can no longer play full-time football. We hope each of these lads find a successful career outside the game. Nowadays, Mark Fleet has certainly made a name for himself outside the game. Unlike midfielder Giles Stille who now works as a coach and manager in Swedish football, it’s in the world of financial services where Fleet has proved himself. He is currently Distribution Director at Skipton Building Society, having previously held been managing director at AWD Moneyextra and Skipton Financial Services. Having done a Google search, I found that there are quite a few interviews and quotes of his on various financial news sites. As you can imagine, it’s mostly almost unrecognisable from the lingo you usually hear from professional footballers. I did try to contact Mark Fleet at Skipton by calling his office to see if I could grab an interview and ask about his memories of his playing days as well as charting the dramatic change and upturn in his career. Sadly, I didn’t get a reply! This blast from the past is a spectacular illustration of how high hopes from pre-season can prove wildly off the mark. Look at these two daft-looking chaps with Argus banner rolled around their heads. They’re clearly imbued with the kind of elevated expectations that hadn’t yet been ground down by decades of disappointment as a Brighton supporter! Albion embark on their fourth successive season in the Second Division after going so close to promotion only two months ago. 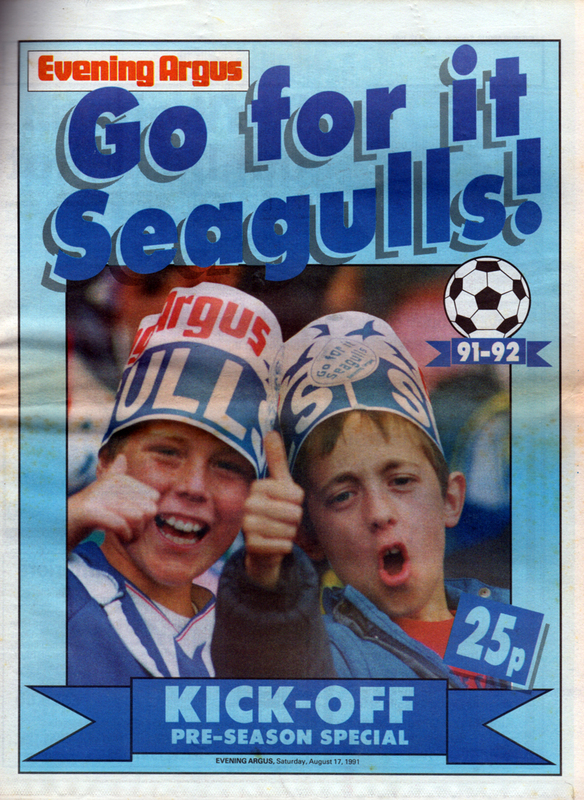 This campaign, the Seagulls aim to recover the championship place they lost in 1983 by gaining an entry place outright instead of an ordeal by play-off. “It is more important now than ever before to get into the First Division,” says manager Barry Lloyd. Brighton certainly didn’t need the Play-Offs this time around – they were relegated! 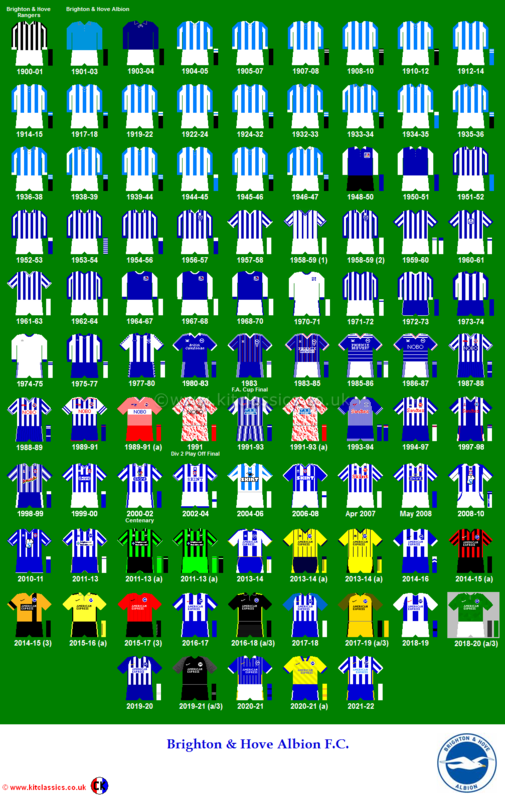 In 1990/91, the final home league match against Ipswich secured Brighton’s Play-Off position. A year later, the final away match against Ipswich secured Brighton’s relegation, and to rub Albion fans’ noses in it, it was also celebration time for Ipswich Town who had achieved the dream that continues to elude the Seagulls – promotion to the Premier League. How is that a club that had previously reached the Play-offs, now found themselves relegated? On the outset, many supporters point to what a fluke the 1990/91 season really was as Albion conceded more goals than they scored in the League and yet were almost promoted. Even so, a side that gave Liverpool such a run for their money over two FA Cup games must have had something going for it. Yet once star strikers Mike Small (to West Ham) and John Byrne (to Sunderland) departed the Goldstone in 1991, there seemed to be only one direction for Brighton to head, and that was downwards. The less-than-stellar performances of their replacements Mark Farrington and Raphael Meade did little to halt the slide. Nevertheless, Barry Lloyd still proved himself capable of unearthing a gem of a signing on occasion, such as with Mark Gall, a £45,000 bargain from Maidstone United, who rewarded his manager with his skill and strength, not to mention fourteen goals. However, when Lloyd was appointed to the Board as managing director in December with the task of the day-to-day running of the club, it most certainly took his eye off what was happening on the pitch. It also led to Martin Hinshelwood’s influence on first-team matters increasing. A recipe for disaster? 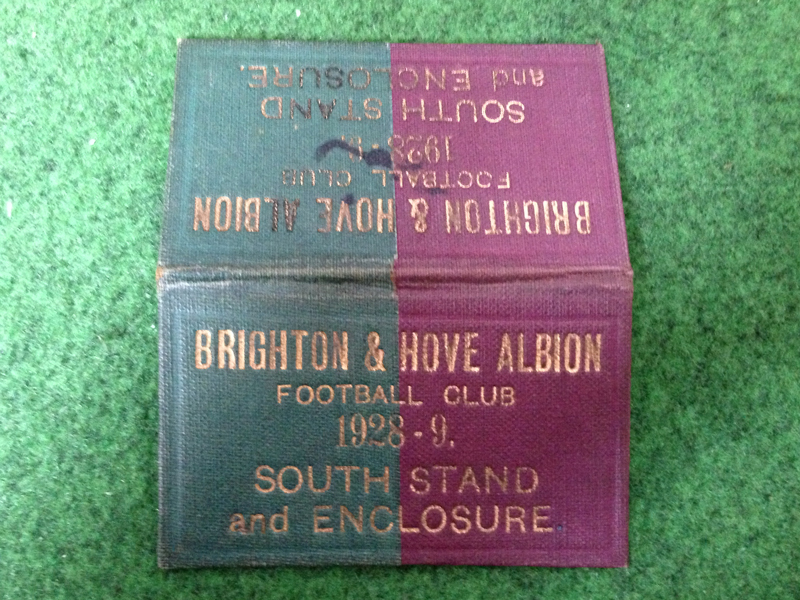 Ancient Albion season tickets – from the 1920s and 1930s! Eighty year or so years ago, if you had bought a season ticket at the Goldstone Ground, you’d have received a card that would have looked something like these. And what exquisite items they are! 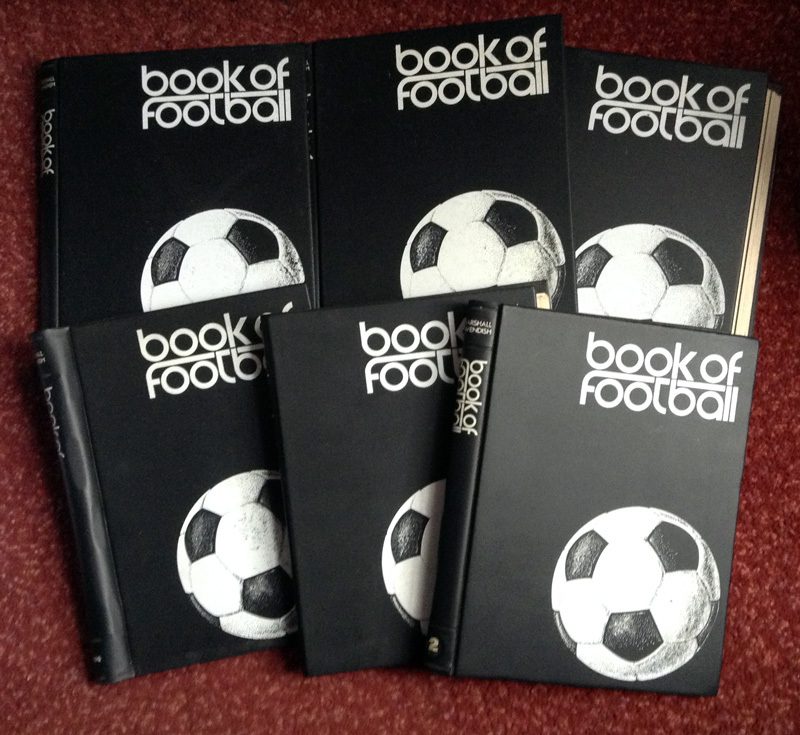 They’d have fitted easily into your wallet, purse or even your cigarette case… and probably quite easy to lose as well. Presented with some classy gold lettering, this is the burgundy and green season ticket for the South Stand and Enclosure from 1928/29. With a single horizontal fold, they opened up to list the terms and conditions in blue ink, not to mention the signature of Charlie Webb, Brighton boss from 1919 to 1947. By 1930/31, the colour of the card had changed to a suspiciously Crystal Palace-like red-and-white combination. Having said that, although in the same division, Palace were yet to become arch rivals and, anyway, they played in claret and light blue at the time, so it’s the first card that most matched their colours, not this one. 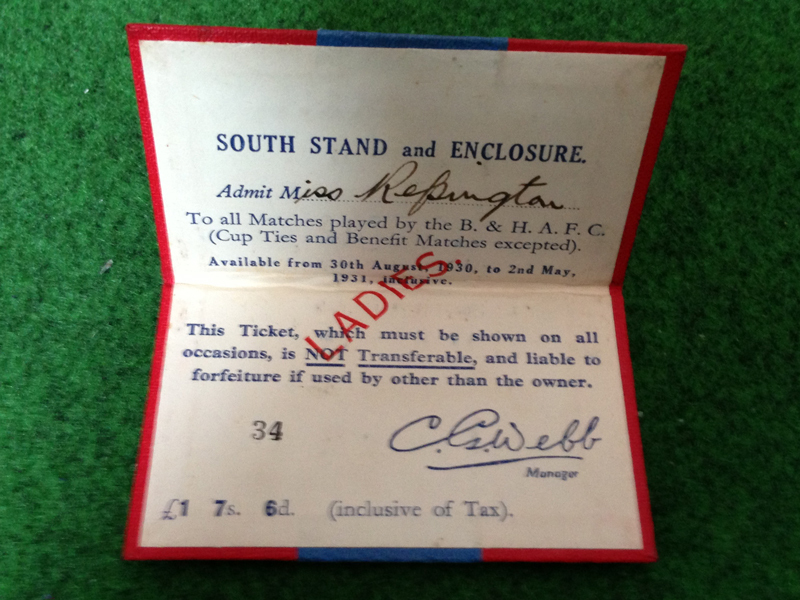 As you can see, the price for a season ticket for Ladies was £1 7s 6d (I wonder if this was the same price for men) which, using the thoroughly useful Measuring Worth website, suggests it would be the equivalent to somewhere between £71.33 (using the purchasing power calculator) to £449.20 (the economic power value). Interestingly, the latter value is roughly what my current season ticket at the Amex Stadium costs today. 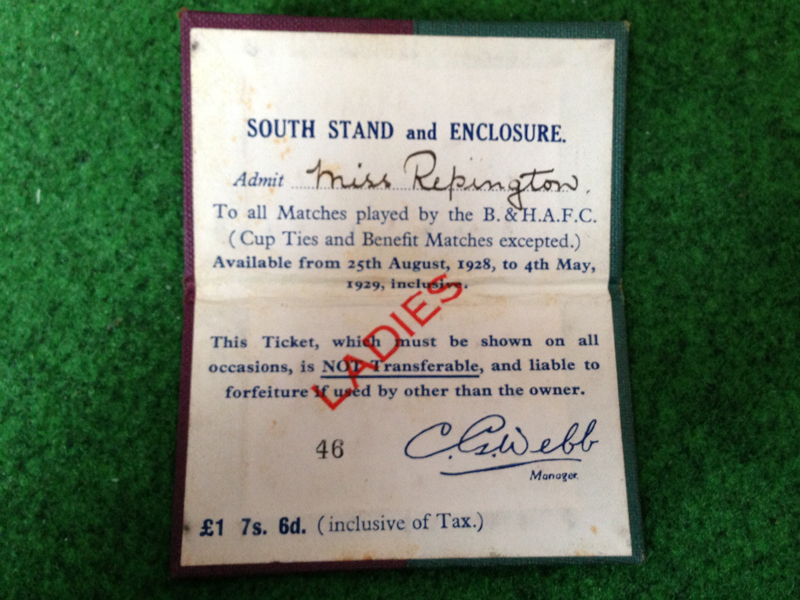 And what joyous football entertainment was Miss Repington able to enjoy in those two seasons in the Football League Division Three (South)? 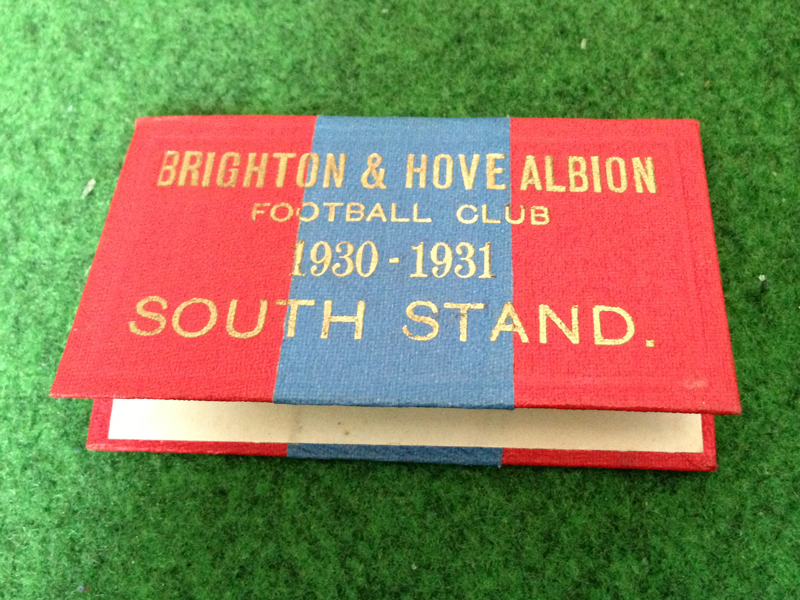 In 1928/29, Brighton dropped eleven places to fall to 15th position but at least she would have enjoyed some formidable performances in the home matches as the Albion won fourteen of their 21 League matches at the Goldstone. By 1930/31, the team had arrested their decline despite losing then record scorer Hugh Vallance in October (for ‘serious misdemenour’) and surged back up to fourth position. Again, the Albion had turned the Goldstone Ground into a fortress, with thirteen victories being recorded there. Due to the fact you had to be Champions to get promoted, chances of going up were severely limited. It took another twenty-seven years for this to be achieved by Brighton. I hope Miss Repington got to see it! (Many thanks to southasp for supplying me with the season ticket cards). A wonderful glimpse of life at the Goldstone in the summer of 1981, with a shot of Moshe Gariani and co getting it together for the pre-season photo shoot, plus interviews with new Albion men Mike Bailey and Tony Grealish. And, blimey, Michael Robinson signs a ten year contract! Whatever he was doing in pre-season in 1991, it was certainly not at the Goldstone Ground. 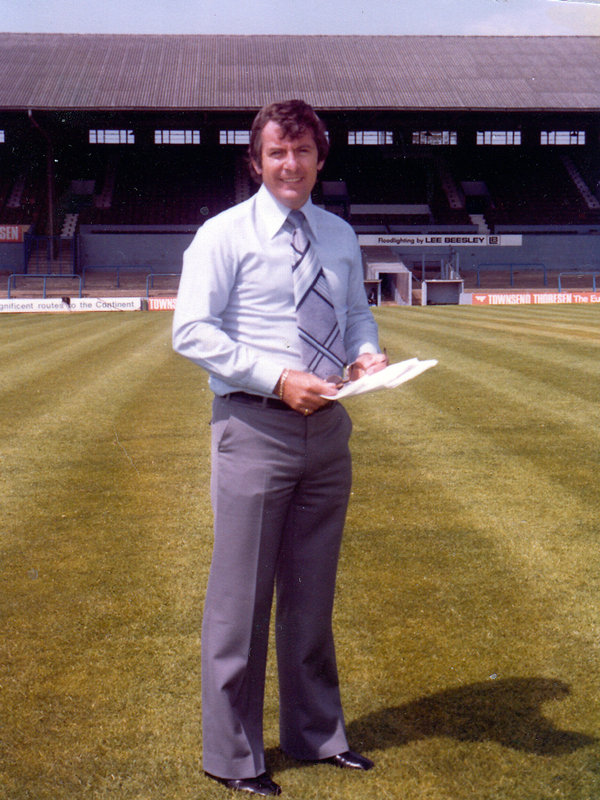 Alan Mullery – Brighton’s best manager? As part of the celebrations of the 125th Anniversary of The Football League, this week we’re giving you the chance to vote for your club’s greatest ever manager. As far as Brighton & Hove Albion bosses go, the choices are Billy Lane, Alan Mullery, Micky Adams, Mike Bailey and Gus Poyet. You can vote for who you think is the greatest here. However, while young fans will probably plump for Gus Poyet, one of the frontrunners in this vote, surely there is a much stronger case for Alan Mullery? Poyet led the Seagulls to one glorious promotion and, of course, came very close to a second. But this is eclipsed by Mullery’s achievements. 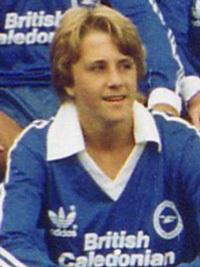 The former England international midfielder guided Brighton to promotion twice to usher the club into the top flight for the first time ever. 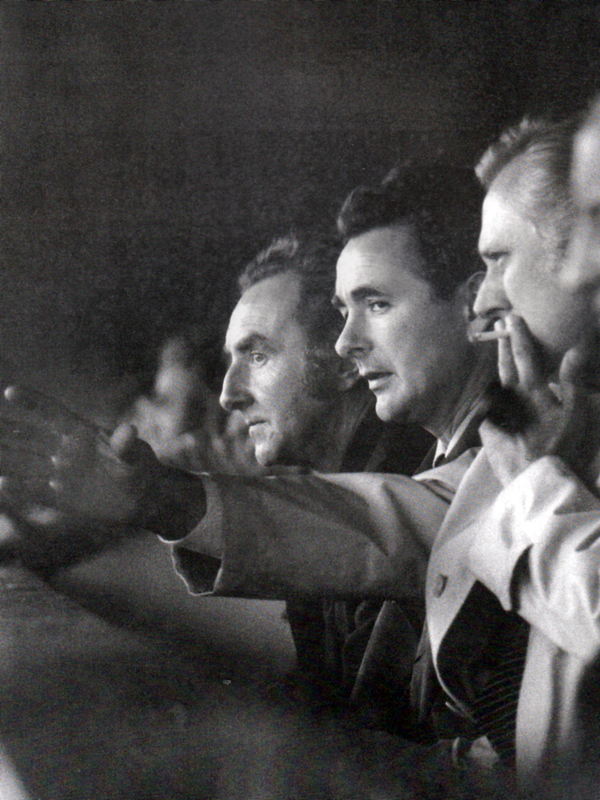 Once there, he successfully kept Albion there for two seasons before leaving his job. “People still try to tell me that this Brighton side is Taylor’s team – but they could not be more wrong,” says Bamber. Mullery, a natural leader and born winner, won’t rest until he has steered Brighton to the top. And with the experience – and financial resources he has at his disposal – only a fool would bet against him doing it. “This is a fantastic club to work for and I’m loving every minute of it here,” he says. Mullery certainly had a way with words and he kept his promise. His second stint at the Goldstone was creditable, but it is the meteoric rise of the club in his first spell that will live long in the memory.